Lancaster City boss Phil Brown insists his side are confident but not complacent as their bid to win the Evo-Stik First Division North title enters the final 10 games. An impressive 3-1 victory at promotion rivals Ossett Town on Saturday means the Dolly Blues have won their last five and remain nine points clear at the top of the pile. Farsley Celtic still have three games in hand in second after their game at Mossley was called off on Tuesday night. But Brown, whose side next host Brighouse Town on Saturday, says City aren’t looking anywhere else for any favours as they look to seal promotion. “We’re entering the final countdown,” said the Blues boss. “We’ve won five in a row, we were undefeated in February and have only lost one in eight games. “People might be looking at how Farsley are getting on but I’m sure they’re looking at us. “Confidence is high but we’re not complacent and there’s plenty of realism. “There’s a real hunger to see the job out and it’s all about us. “The focus is fully on the next game against Brighouse and we’re taking nothing for granted. “If we start thinking, ‘if we win and they lose’ it’s dangerous and it can affect your performance. Brighouse have been in and around the play-off picture all season and head to Giant Axe five points outside the top five with games in hand. “They’re a well-organised side who know how to get results,” Brown said. “They’re quite strong and robust with a real competitive edge. “They’ve been in and around it all season and looking at the table with 10 or 11 games to go they’ll think they can make the play-offs. The fifth straight win came with another fine display in West Yorkshire as the Blues flew out of the blocks at the 4G Voice & Data Stadium. “Ossett on paper was a really difficult game for us,” said Brown. “Recently we’ve started our games away from home well and we did that again. “We could have been out of sight in the first 30 minutes. “We showed great energy and a really positive mindset. “We went there to get the three points and the result didn’t flatter us at all. Tom Kilifin opened the scoring with his first goal back in Dolly Blue with Jacob Gregory and Jordan Connerton also on target, the latter bagging a 20th league goal of the season. “Tom’s had to bide his time and we thought it was the right time to start him,” said Brown. 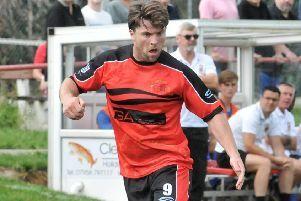 “Louis Mayers has done brilliantly and led the line really well but has played a lot of football. “Jordan’s been scoring but we just wanted to look at a different combination that gave us a little bit more mobility up top. “It worked well and Tom took played well and got his goal. Joshua Westwood will be available again against Brighouse after missing the Ossett win due to a family commitment.